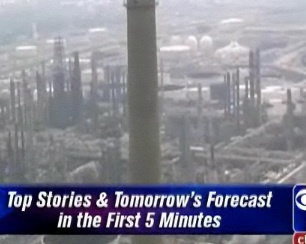 It’s time to call BS on WGCL’s claim of producing the “top stories and tomorrow’s forecast in the first five minutes” on its nightly 11 o’clock news. On Friday, the forecast didn’t appear until six minutes and ten seconds into the newscast. On Thursday, it was at five minutes and fifteen seconds. This is nitpicking, yes. But the promotion is very specific. It doesn’t say “in roughly the first five minutes.” The promotion is objectionable for three reasons: It’s not true. It’s unnecessary. And WGCL insists on displaying its “first 5 minutes” graphic almost non-stop during the first five (or six or whatever) minutes of its 11pm newscast. This makes it a very long-winded untruth. Plus, the graphic is obnoxious. It’s too large and too opaque. On Friday, during a package on Hurricane Ike, a CBS feed reporter showed waves hitting “this seventeen foot sea wall.” But the graphic almost completely covered the video of the wall. Best advice: Get rid of the promotion completely. TV newscasts need flexibility. If WGCL had stuck the forecast into its first five minutes Friday, it would have awkwardly broken up its coverage of Ike and the resultant gasoline price spikes. The gas price piece, by Christopher King, was a fine bit of news wizardry. 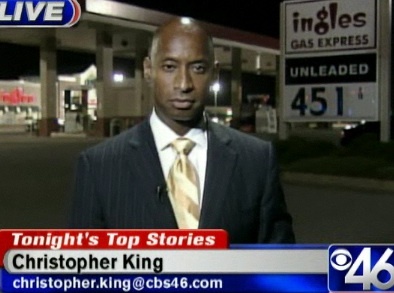 In King’s live shot, he stood before an Ingles store which had jacked up the price of a gallon of gas to $5.25 Friday. “That’s not to suggest they were gouging,” King said, in a line that probably made WGCL’s lawyers breathe easier. Then King’s report clearly suggested otherwise. It was an excellent case of allowing the facts to speak for themselves and letting the viewer decide. And it deserved its spot ahead of “tomorrow’s forecast.” Honestly, we can wait for the forecast. Stick to the facts, as King did. And stick to the truth. This performance of “Liar Liar” by the Castaways appears in 1967’s “It’s a Bikini World,” which will play in December on Turner Classic Movies. Our source at TCM says this movie really swings, daddy-o. This entry was posted in WGCL on September 14, 2008 by live apt fire. they can keep their 5, 7, 10 mins of what they call news. Atlanta news has never been about “letting the viewer decide.” It’s full of spin, spin, and more spin. Somebody please let them know that in today’s tech world, we see the feeds the same time they do and can see the spin. I say get rid of the news cast all together or atleast give me 5 mins when its happening. Who cares if your reporter is outside the police headquaters 6 hours after it happened. those graphics at the bottom of the screen are a pain for sure…even the small ones tend to block something….. I realize that stations have to continually toot their own horn, otherwise people forget which channel they’re watching…..but c’mon! you got that right rptrcub! and radio is just as bad, if not worse!